A few days after Litecoin Foundation’s Community manager Ilir Gashi asked everyone to keep their expectations in check with respect to the Foundation’s work on Litecoin’s fungibility and privacy features, it would seem that the Foundation is nonetheless surging ahead. This was communicated by Charlie Lee on Twitter. Lee, the creator of Litecoin, the silver to Bitcoin’s gold, had keenly announced last week that he will be pursuing fungibility and privacy solutions for the cryptocurrency. This announcement was met by a lot of fanfare, especially by the many who welcomed Charlie Lee’s promise to add Confidential transaction features to Litecoin. However, this enthusiasm had mellowed somewhat when Gashi has clarified that nothing was set in stone and that all possible solutions for fungibility were still being investigated. 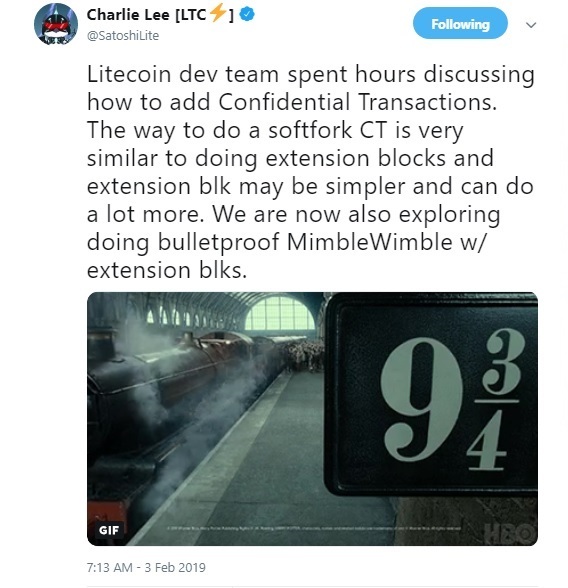 However, Charlie Lee’s latest tweet suggests that the Litecoin Foundation is moving ahead with the Confidential Transactions feature that he had initially advertised. Furthermore, Lee also tweeted that his development team was exploring bulletproof MimbleWimble with extension blocks to resolve the fungibility issue, a solution that could be implemented via a soft fork. The MimbleWimble protocol, with its name inspired by the Harry Potter universe, is essentially a privacy protocol devised by Tom Elvis Jedusor. Privacy coins such as Grin and Beam have already been built on this protocol while Monero, the other major privacy coin had been implementing it through a sidechain, Tari. This protocol allows the user to encrypt all data associated with any transaction of cryptocurrency using blinding factors, thereby adding an extra layer of security to all transactions. Additionally, the MimbleWimble protocol uses an innovation called CoinJoin, a mechanism that combines multiple payment info to form a single chain of the transaction, making it very difficult for any outside party to find out which payment came from which user and was meant for whom. Charlie Lee has, in fact, commented on MimbleWimble technology previously where he found it interesting how the technology makes a system private when data is removed by extension, making the coin in question more scalable than Bitcoin. In response to the queries of his tweet, Lee also clarified that there was no question of ever implementing Confidential Transactions without them being bulletproof. In fact, he suggests that the core development team had decided on bulletproofs over Elgamal commitments and switch commitments. Charlie Lee also clarified that adding CT features would not adversely affect the ability to mine coins.